That’s not to say Queen Elizabeth II, bless her hat-wearing heart, was a babe with a bow on her 1976 cover of the 119-year-old magazine. But the May cover girl certainly is. That’s not to say Queen Elizabeth II, bless her hat-wearing heart, was a babe with a bow on her 1976 cover of the 119-year-old magazine. But the May cover girl certainly is. Eva Shockey, who co-hosts Jim Shockey’s Outdoor Adventures with her father, stands proud on the front page as a representation of where the sport is heading. As the NSSF reports (via Outdoor Channel), 3.35 million women currently hunt. That’s an increase of 10 percent from 2008. More women are spending time and money in sporting shops, guns with pink grips are being marketed to women young and old for far more than self-defense. My last trip to the range probably saw women outnumbering men, though I didn’t see a single one shooting solo. What I like most about Eva is that she sounds kind of like me. I’ve never shot a bow, but I have shot a rifle, and I enjoyed it—and was a wee bit terrified by it, too. To Outdoor Channel, she said: “I’m just like a lot of hunters who are from the younger generation. I don’t have 40 years experience. I’m nervous to hunt because I don’t always know why we’re doing something. I don’t know what to do and what decisions to make. I think people can relate to that.” I love that quote because I understand the sentiment. I like that she’s not a pro and doesn’t pretend to be one. 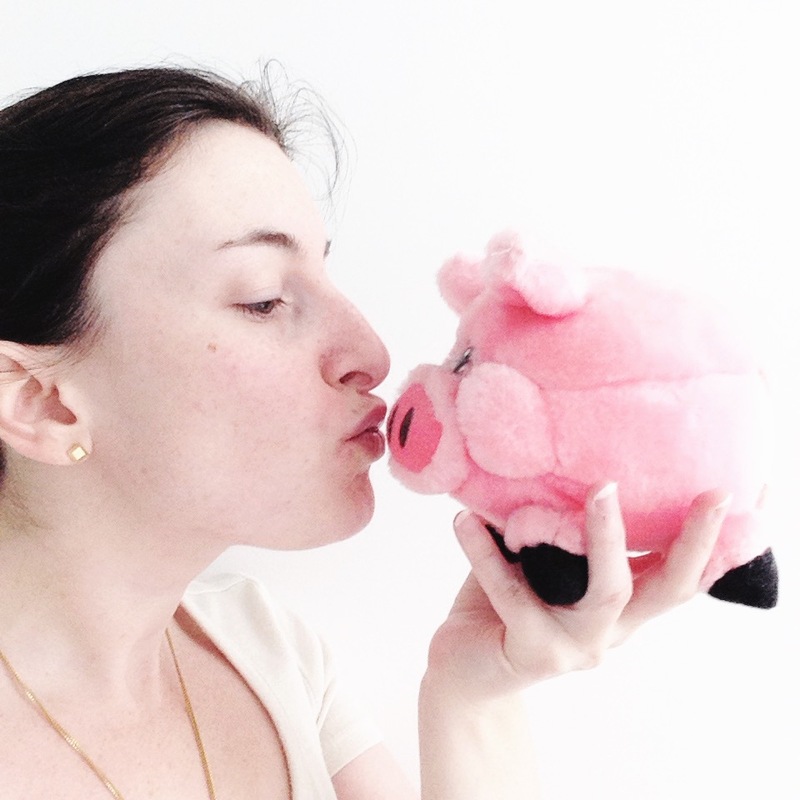 In fact, she embraces her average-ness. It’s sort of what makes a star of the people, don’t you think? Consider Jennifer Lawrence and Shailene Woodley—we love them because to us, they are relatable. So, an apt choice, I would say. On tap for this week: A closer look at hunting, gun laws and all things redneck. The rhythmic bleating of cricket frogs I was used to. The high-pitched chirping of tree frogs? Yes, I could identify that. But this was surely extra-terrestrial, E.T. meets Contact, fire alarm by way of fog horn. It was half past midnight when I opened the back door and released Charlie into the night. The skittish Goldendoodle planted his feet at the top of the steps and threw his head back. He whoofed the night air, inhaling deeply and then thrusting the offensive scents away from him with an indignant snort. Something was afoot. And whatever had incited his scramble for the backyard moments earlier retreated. It can very well wait ‘til morning, thought he. And I’m sure if he could, he would have crossed those fluffy legs of his and beat a retreat. Then I heard what he had so precipitously smelled. Wah wah wah, it sounded. I reached for a flashlight. Wah wah wahh, it went. What the bloody f—, I thought. Rustle, shuffle, rustle, then again: wah wah wah. It was coming closer, booming louder, and now I was alone at the top of the steps; my guard dog had fled to the shadow of the doorframe. The rhythmic bleating of cricket frogs I was used to. The high-pitched chirping of tree frogs? Yes, I could identify that. But this was surely extra-terrestrial, E.T. meets Contact, fire alarm by way of fog horn. My brain clicked through different possibilities and settled on the villain illustrated in the nearby yellow signs. Alligator. Alligators eat dogs. Click click. Crocodiles can climb trees. Click click click. Prepare the house for siege; the drop gators are coming. Amphibians, pfft, I thought. I snatched up my iPhone and soon became an expert in frog calls. Not a ribbit. Not a croak. Not this, not that, definitely not that. As I crossed each hopper off the list, a triumphant terror blossomed on my chest, the intersection of being right and being right about something it would have been nice to be wrong about. And then, a sinking happiness. Audio confirmed it: My drop gators were just bloated bullfrogs. Did you know those things can be 8 inches long? Freaky. The only thing more boring to report on than an awards show where the winners are announced ahead of time is a town council meeting. You know what’s going to happen, you know when it’s going to happen and you know exactly who the players are and what they’ve done to snag a spot in next week’s minutes. But that’s not this reporter’s assignment. New York Magazine sent Andrew Rice to the Roosevelt Hotel ballroom to be a fly on the wall at the James Polk Awards, which highlight the year’s best investigative journalism. Naturally, that would feature those who leaked Edward Snowden’s infamous NSA documents. The hitch: Two of them, Laura Poitras and Glenn Greenwald, haven’t set foot in the United States since the story broke for fear of detainment. When word came this week that the pair would brave the flight (not to mention those awkward stare-downs at customs), the media realm started buzzing. Word came that they were in transit; we bit our lips and crossed our fingers. Word came that they’d made it through airport security safely; we (collectively—I wasn’t in the ballroom, after all) applauded. Rice captured the feeling in the room when we all finally exhaled. And he did it nonchalantly. His article isn’t effusive or inflated. It is very much what happened, down to the acid-washed jeans Greenwald wore to accept the prize. Read the rest of the story at New York Magazine, here. Already, I can see stories forming, just like the waves being pushed up, up, up by the wind and a dozen other invisible forces. Headlines–the first things to come to mind when I write–leap along axons. Themes like fear, and physics and engineering overwhelm the senses. What are the best surfers in the world thinking when they tackle world records? What are newbies thinking when they ride double overhead for the first time and see the water closing in? And how on earth do those bikinis stay put through duck dives and turtles and paddling and wipe-outs? OK. So maybe the last question is a little bolder than the others. The Huffington Post just published a piece a few days ago about hiking Mount Huashan. Billed as the most dangerous trek in the world–and all you need to do is take a look at the pictures to see why they call it that–Mount Huashan comprises five sometimes vertical peaks. As I scrolled through the pictures, though, it wasn’t the three-wide planks built into the rock that caught my fancy, but the locks attached to the thick iron chains. Perhaps they mark where travelers gave up, I thought. Nope. 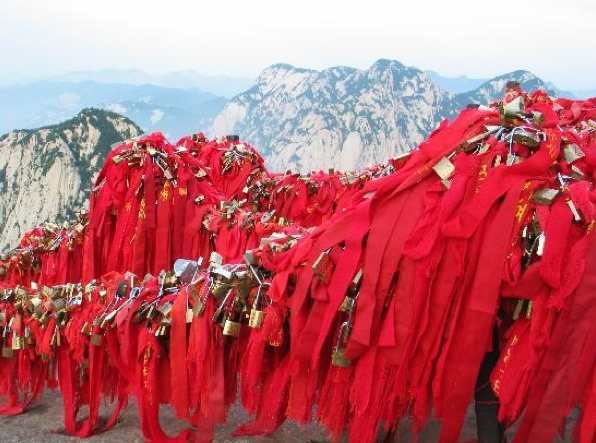 They’re for luck–the lucky golden locks of Mount Huashan. But back to the locks. Legend has it the higher you carry your lock, the greater the chance your wish will come true. The higher the elevation, the heavier the chains. And of course, you can buy your lucky lock for just 20 RMB.